“Do you like it here? I mean, don’t you miss the sunshine and warmth of Phoenix?” This is something that I have been asked lately. Funny how that is. Maybe it is because we have experienced an umpteenth cloudy and rain filled days. I have been asked this multiple times in the last two months. It is usually followed up with, “Do you think you will ever go into business again for yourself?” I am coming upon my sixth anniversary of moving here and these two question seem like they are on repeat in my life right now. I can quickly answered both of those questions. First: No, I do not miss the sunshine of Phoenix or the dry air. I truly enjoy experiencing the mild changing of seasons we posses here. 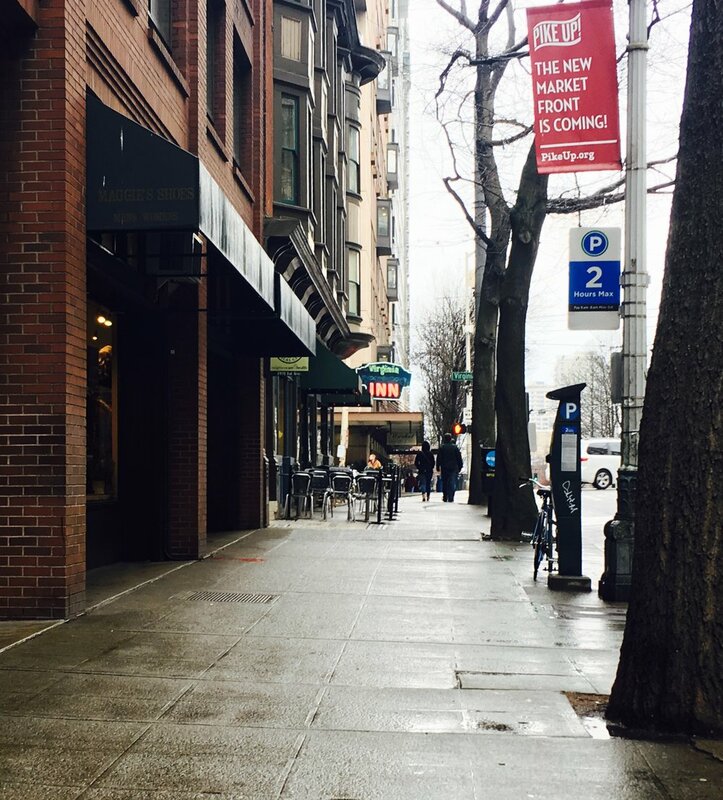 I find living near the water, mountains, trees, and city life in Seattle extremely refreshing. The rain only makes me appreciate the bounty that grows here, not to mention it makes me look forard to the sunshine and beautiful days here to come. Second: I do not have any desire to go into business for myself ever again. I enjoy going to work, and coming home. I like having two separate spaces in my life. When I owned my own bakery and catering business it seemed as though they were never two separate things (work / personal life) I ate, slept, dreamed, breathed, and lived my business. They were never two separate things and it was hard to decompress, relax, and was inhabiting my health. Starting over again here in Seattle after closing it all was hard (and a bit depressing I will admit), but I slept a sound and peaceful full night for the first time in years after I moved here. Although, with these questions about my life and business in Phoenix have made me miss some things. I miss the friends we made there. In the past six years many of them have experienced milestones that I hate missing and not being a part of. All of these questions about the business have made me reflect on many of the recipes I made daily at my bakery. Some I could care less to ever make again, some carry stigma / tension that I do not want to revisit, and some are fun to make on a rare occasion. Something... like a Margarita Tart. I designed this recipe after a friend from New Jersey referred to our move to Phoenix as “moving to the land of margaritas”! 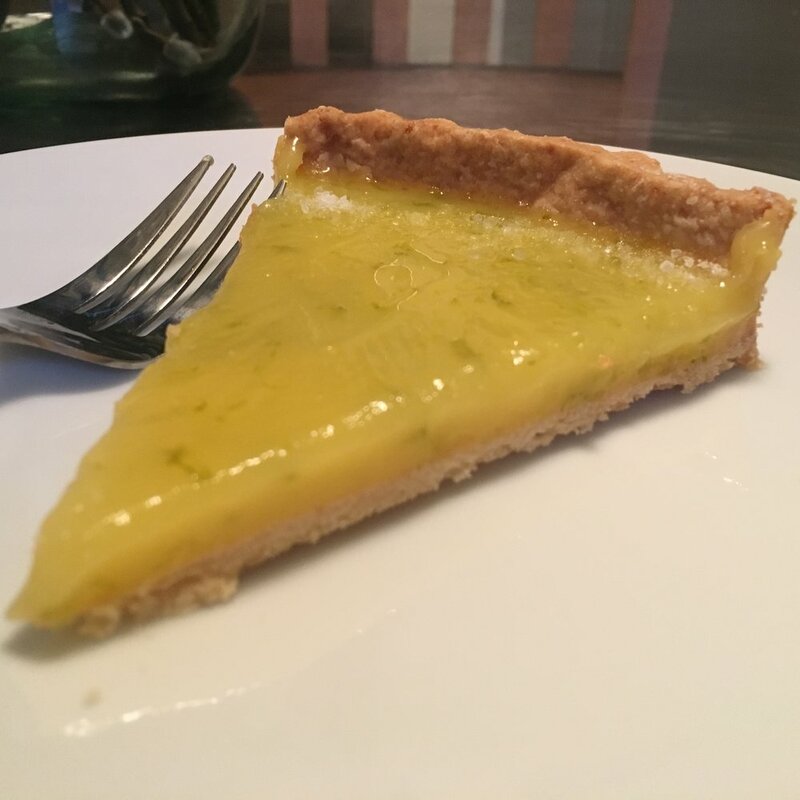 This tart has a crunchy, all butter crust, with a lime and tequila curd laying over it. 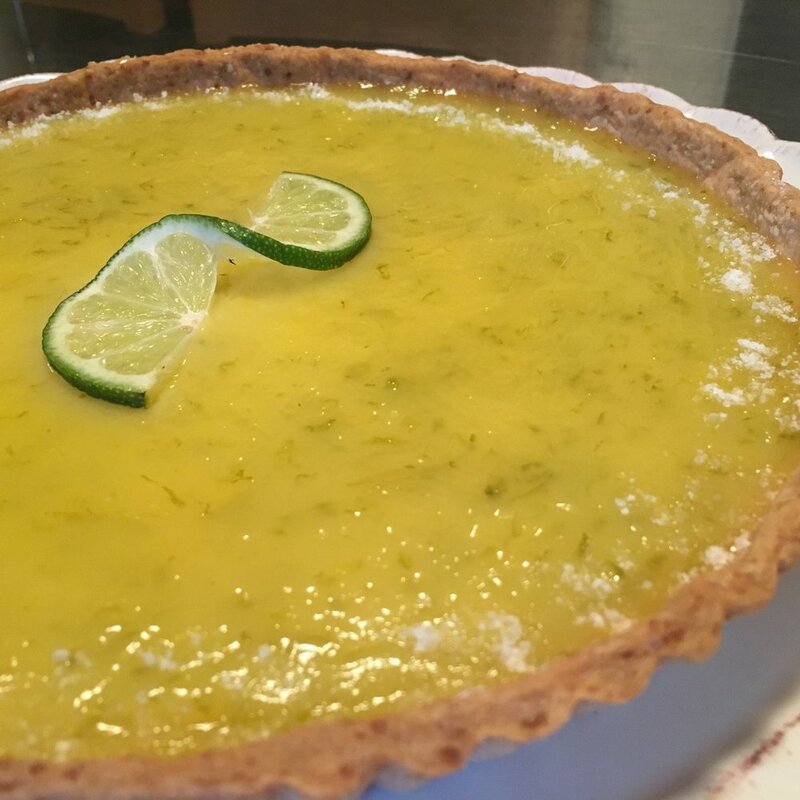 The rim of the crust gets salted like the rim of a margarita glass, and I always garnished the tart with a fresh slice of lime. To some the whole concept of this dessert may have seemed strange, but from the many who would try it fell in love with it. This dessert cures the sweet / sour caving that many have and I'm sure the salted rim may seem out of place in a dessert to many, but in this case it rounds out the flavor and really finishes this dessert well. I made this tart last week. It was a good reflection of everything we have experienced and where we came from. In some ways it reminded me who I was. Sometimes a good drink or sweet is all you need for that. In this case it is a combination of them both. First; place your yolks and sugar in a pan (at least 8 inches in diameter) and whisk it well and smooth. Pour in the lime juice and tequila and whisk it together until incorporated. Next; place the butter into the mixture and place the whole thing over medium to low heat. Stirring it constantly with a silicon spatula scraping the bottom and sides of the pan while doing so. You will notice that you butter will slowly melt into you mixture, and then you will see your mixture start to thicken. Once it is thick enough to coat the back of a spoon and leaves a trail in the pan while stirring you are done. Finally; remove the tart from the tart pan carefully. Place on the platter or plate that you wish to serve it on. Sprinkle the edge of your tart with the sea salt much like the rim of a margarita glass would be coated. Place your lime slice to garnish as you wish and serve, Serve chilled. Will last for up to 3 days, if kept refrigerated. First; place the flour, sugar, and sea salt in the base of a food processor fitted with a blade attachment. Next; place the well chilled butter chunks over the flour mixture and pulse your blade until the butter is chopped into very fine pieces. Once that is achieved add your ice water a tablespoon at a time with the blade running until the dough seems to come together. It should hold together tightly when pinched - that is how you know it ready. I always test after 2 tablespoons of water have been incorporated. Then; roll the dough into a ball and on a well floured surface roll out your dough to about 1/4 inch thick keeping it round in shape. Place the rolled out dough into your 9 inch tart pan. Press it into place (carefully paying attention and pressing to the corner of the rim of your pan to keep an angle) and trim your edges as needed with a sharp knife. Dock the dough several times with a fork and place the entire dough and pan into the freezer to chill and set. About an hour. Finally; preheat your oven to 375 degrees. When heated place your chilled dough lined tart pan on a sheet pan. Line the tart crust with parchment paper (I let mine over hang the sides by at least and inch) and fill with pie weights (I use dried beans or rice I do not want to use for cooking). This is to hold your parchment down and keep your crust from puffing while baking. Bake about 30 - 40 minutes before removing from the oven. Gently remove the parchment with your weights off the dough and place the tart dough back in the oven for another 20 minutes or more. You are looking for the crust to have a deeply golden color. Remove from oven and let cool completely before continuing.